At the Indian Gaming Show, Gigabyte AORUS AD27QD tactical gaming monitor was launched. This monitor takes PC games to a whole new level, which can be set up for games like PUBG, CS:GO, Dota 2. It also provides excellent experience in games like Battlefield V and Anthem. 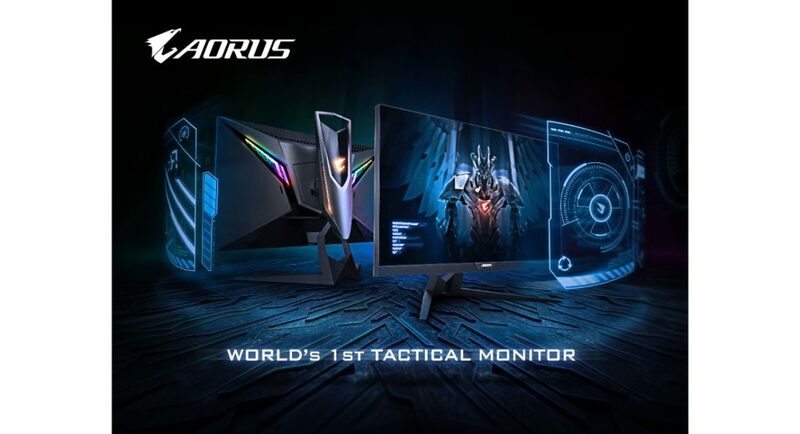 The AORUS AD27QD is a 27-inch flat screen frameless monitor which sports an IPS panel with QHD 2,560X1,440, 2K display. It provides a 144Hz refresh rate in 1ms response time. The viewing angles supported are up to 178 degrees and it meets 95% DCI-P3 standards along wit 10bitscolor. The AORUS AD27QD monitor has passed VESA certified Display HDR400 standards that is meant to provide users with spectacular display quality. Also, the monitor has been incorporated with AMD Radeon Free technology that can provide gamers with a fluent gaming experience in order to provide the game without picture stripping. The outer design of the monitor is to replicate the flight of the falcon pursuing its prey. There is a falcon diving on the side of the monitor’s stand and wings flapping with the flash of the LED light at the back. There is a handle on top of the stand which will help users to move the monitor conveniently. Also, there is a rubber cable tie below the ports and a reserved hole at the bottom of the stand. This has been made so that the cables can connect smoothly without mingling up with each other. The AORUS AD27QD has several features that includes black equalizer, aim stabiliser, game assist, hardware information dashboard and OSD Sidekick, to name a few. These features are meant to help gamers gain more control in the game and their PC. The AORUS AD27QD uses a joystick to control the OSD Sidekick. Also, the OSD Sidekick software can be used to adjust the monitor with the help of the mouse. The device is set with a PIP/PBP display mode that can let you display 2 screens in one monitor. Furthermore, the AORUS AD27QD monitor has an anti-blue light filter along with flicker free features. There is a dedicated USB port that provides up to 5V/1.5A quick charge facility to charge mobile phones. Lastly, this monitor can spin 90 degrees for a vertical screen view, rotate 20 degrees sideways and 5to21 degrees up/down. The height of this monitor can be adjusted to 130 cm. Price is yet to be announced.